Hofa Plug-ins is working on the second version of its IQ-Analyser plug-in, which will include user-requested features. HoRNet’s new plug-in is a key detector that works with polyphonic audio material. RTW announced the release of its first plug-in for Mac and PC, a loudness meter in the brand new Mastering PlugIns Series. 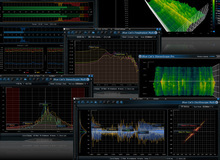 beDSP is a young company created in 2013, they develop software and plug-ins dedicated to audio signal metering and normalizing. Ian Shepherd partnered with MeterPlugs to design a plug-in that helps you find the right balanced between dynamics and loudness. NTI Audio announces that its speaker test software is now available in three different editions, depending on your needs and budget.